One of the many very useful landscaping plants from New Zealand is Coprosma repens. Evergreen and offered in a range of foliage colours by wholesalers, they are very popular and easy care landscaping plant. A glossy foliaged low growing plant widely used as a ground cover plant and a valuable asset to many landscaping situations. Generally reaching around 1.5m in height these are a resilient shrub that grow well in adverse conditions including coastal areas. The species has green foliage, very glossy, giving it the common name or ‘mirror plant’. However it is the many cultivars that wholesale growers offer that are most widely grown. Most cultivars grow well in all but the coldest areas. Coprosma repens is well suited to a range of soil conditions, and will grow in sandy coastal soils. It does require good drainage and performs best in full sun. Best pruned in late winter, however they can be pruned to shape in summer as well without many problems. Suited to growing in pots and containers as well as for mass planting as a low maintenance ground cover plant. Coprosma repens ‘tequila sunrise’ – Foliage is deep green in the centre, to lime green and then margined with red. Coprosma repens ‘ fireburst – Deep red foliage margined with bright pink. 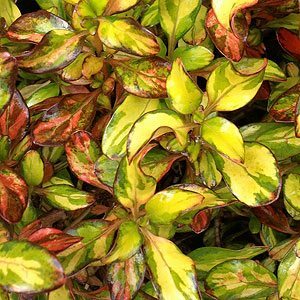 Coprosma repens ‘pacific sunset’ – Mid red foliage margined with a deeper red. Coprosma repens variegata – Deep green foliage margined with cream to golden yellow.